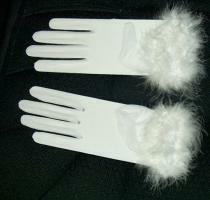 Ladies White Lace Formal Dress Gloves. Ladies simple white lace dress gloves. 1 pair. Simple open net knit lace with great stretchability. Feathered trim on cuff. Great for use at formal events such as weddings, church, etc. Approximately 10 inches long from fingertips to cuff. Each pair is individually packaged in its own resealable poly bag.